In Canada, a substantial issuer bid (SIB) is the formal term for a tender offer to repurchase shares. SIBs can be used to buy back an unusually large amount of shares beyond what’s allowed with a typical NCIB buyback program (Normal Course Issuer Bid). Tender offers may be a sign of improving corporate governance or savvy management taking advantage of their stock’s undervaluation. Or, large buybacks might simply be misleading demonstrations of confidence in a company’s prospects. Today, we are excited to introduce the Trump Tracker. It’s a bot that constantly scans new public financial documents for mentions of President Trump. These documents include all SEC filings, conference call transcripts, investor presentations, press releases, and more. The bot instantly surfaces new mentions of Trump as soon as they’re published, while intelligent queries automatically sort them into topics like Obamacare, Mexico, and NAFTA. Anyone interested in following the administration’s impact on public companies can engage with the Trump Tracker by checking the dedicated website, following the @trumptrackerbot Twitter account, or signing up for a daily email alert on the site. When we last wrote about the Trump administration at the end of January, we noted that the markets paid six times as much attention to the new president’s policies as compared to those of President Obama over a comparable time period. Sixty days after President Trump moved into the White House, we see that trend continuing. The number of regulatory filings mentioning President Trump sharply increased after Inauguration Day on January 20th. We measure a total of over 1750 filings mentioning President Trump from January 20th through March 22nd, 939 of which are SEC documents. There is a significant change in the tenor of those mentions as well. 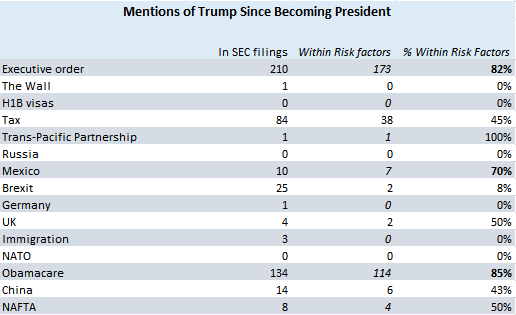 We see references to President Trump shifting from high-level comments to more formal statements in the “Risk Factors” disclosure sections of SEC filings. Overall, 60% of references to President Trump within SEC filings are in the “Risk Factors” section. This is a substantial increase from the less than 15% we observed during the presidential campaign. This trend is even more pronounced in the healthcare industry, where we find that 85% of mentions since Inauguration Day were contained in these sections. 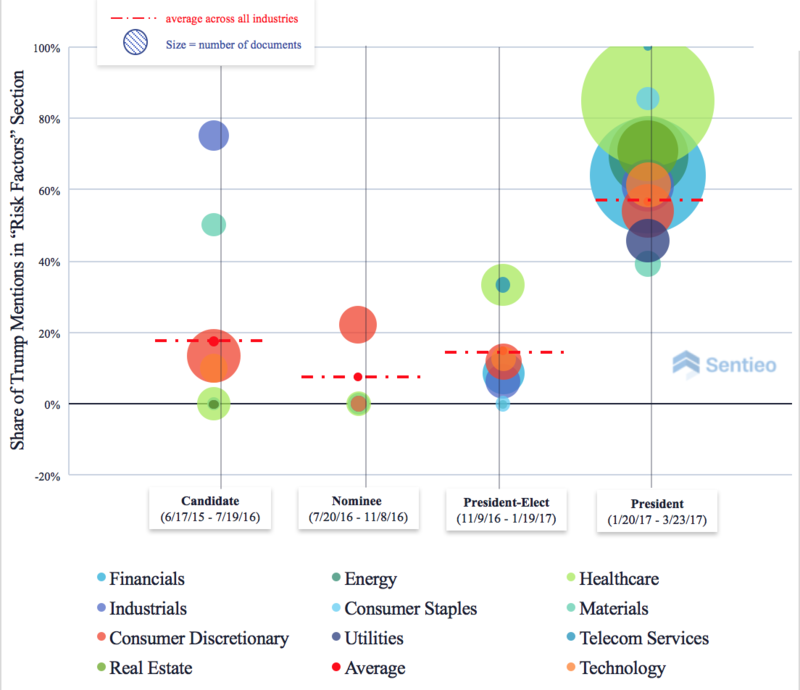 Each bubble in the above graph represents an industry, while the size of each bubble corresponds to the number of SEC filings mentioning President Trump in that industry. The higher the bubble, the larger the share of those mentions present within “Risk Factors” sections. The dotted line, meanwhile, represents the average share of Trump mentions within “Risk Factors” sections across the market. As you can see, both the number of mentions and the share of those mentions contained within “Risk Factors” sections has increased significantly since Inauguration Day. In the months preceding President Trump’s inauguration, only about 15% of mentions were contained in “Risk Factors.” Over the past two months, that number has increased to 60%. In total, Trump has already been mentioned in the “Risk Factors” sections of 10% of all 10Ks filed across all industries since January 20th. Why are Tech and Consumer Discretionary so quiet? We are surprised to find that only 4% of technology companies’ 10Ks and 10Qs filed since January 20th mention Trump at all. Likewise, in the Consumer Discretionary category, only 4% mention Trump. These industries are reliant on overseas manufacturing and foreign workers, both of which are threatened by the President’s stated policies. We would have expected therefore to see a larger share of cautionary statements. These results, therefore, leave us wondering if management teams are rightfully dismissive or if they are hiding their heads in the sand? The Wall: We found only one SEC filing referring to Trump’s wall on the Mexican border. Immigration and H-1B Visas: This is a key issue for many tech companies but also several other industries from Agriculture to anything with a high-street. H-1B visas are not mentioned at all, and Immigration in general is mentioned in only three SEC filings since January 20th. NAFTA: Though Trump has threatened to renegotiate NAFTA, which could threaten American agriculture and associated industries, we find only eight mentions of the topic in SEC filings since January 20th. The Trump Tracker is built on top of Sentieo’s powerful financial document search and keyword alert engine. The Bot is constantly scanning through over 9 million financial documents that include SEC filings, conference call transcripts, investor presentations and press releases. To generate the alerts, we built a series of complex queries that search for the word “Trump” in the proximity to other keywords. In most of these queries we also automatically filter out mentions of some of Trump’s businesses so that our alerts are more focused on real mentions of President Trump. However, the Trump’s Businesses filter allows you to see these mentions. We plan on adding additional themes and would love your feedback. If you have an idea for a new theme, please email us at trumptracker@sentieo.com. Banner image of Trump (at top) from AP Images. Our CEO, Alap Shah, wrote a guest article that appeared in HedgeWeek this morning on the topic of consumer-grade note-taking apps, and why they don’t work for equity analysts*. Investment analysts, by and large, are a pretty smart group. If they can find a better way to do their job, they will. So it’s no surprise that an industry that relies so heavily on information has adopted a number of consumer-grade apps to enhance their workflow. And while better than nothing, this practice can create more problems than it tries to solve. In the analyst community, note-taking apps such as Evernote and OneNote now often serve as the foundation for the research process, in spite of the fact that neither were designed with analysts in mind. Why are these solutions being adopted? First, they are mostly an improvement over the ubiquitous network and folder structure. Second, they are fairly cheap and easy to use. But perhaps most importantly, they bypass internal IT operations that would otherwise express security concerns with such apps. While these solutions do offer an improvement over a network and folder topography, many times they are more like putting square pegs in to a round hole – they might fit, but you’re going to have to smash them in there pretty hard. On the surface, consumer note-taking applications appear to be a good fit to manage the enormous amount of information—broker research, news, internal notes, SEC filings, call transcripts, etc.—that forms the basis of the fundamental research process. However, there are a number of instances where these generic apps fall short, and, ultimately, inject more problems into the research process than they solve.